Karma is the idea that the actions of a person will come back to him at some future date through the forces of the universe. Karma can work in both positive and negative directions. 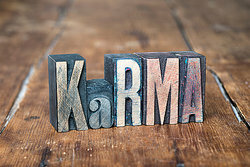 For example, a person who treats others well may not see the immediate benefits of those actions but can trust karma to come back around with a reward in the future. On the other hand, a person who doesn't treat others well might have good reason to hope karma doesn't exist. So what's so funny about karma? Because of its somewhat unpredictable nature, you never know when or where someone's misdeeds will come back to bite them. And let's face it: watching someone be on the receiving end of some of the nasty things they've dealt out to others over the years can be incredibly satisfying. Whether or not you believe in karma as a spiritual idea or just enjoy a good laugh at the idea of bad people getting what they deserve in the end, it's worth considering how you behave as you go about your life. In addition to enjoying a good laugh at these funny quotes, let them serve as a friendly reminder to mind your manners and treat others well. After all, you don't ever want to be on the receiving end of karma's cosmic joke! "Funny Quotes About Karma." YourDictionary, n.d. Web. 26 April 2019. <https://quotes.yourdictionary.com/articles/funny-quotes-about-karma.html>. Karma is the idea that the actions of a person will come back to him at some future date through the forces of the universe. Karma can work in both positive and negative directions. For example, a person who treats others well may not see the immediate benefits of those actions but can trust karma to come back around with a reward in the future. On the other hand, a person who doesn’t treat others well might have good reason to hope karma doesn’t exist.